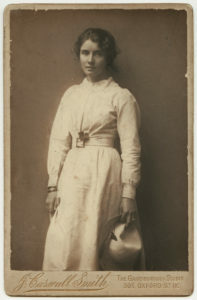 Edna Clarke Hall (nee Waugh) was born in Shipbourne, Kent to the Victorian social campaigner Benjamin Waugh, who founded the National Society for the Prevention of Cruelty to Children. One of ten children she disliked school and was tutored at home, showing an early talent for drawing. William Clarke Hall, whom founded the NSPCC with her father, and who was later to become her husband, arranged for Edna to join the Slade School of Art at the age of fourteen. At The Slade Edna was taught by renowned artist and Professor of Fine Art Henry Tonks, who also taught Shell artist Paul Nash. 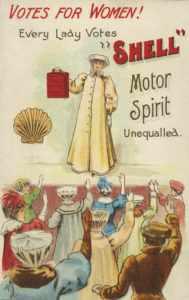 Edna won many certificates and prizes, including a Slade scholarship in 1897. Her favoured medium was watercolour as she liked the quickness and spontaneity of the result. There are some oil paintings that survived from this period which she painted under the guidance of Gwen John whom she studied alongside of Augustus John. In 1898, at the age of nineteen, Edna married William Clarke Hall, 13 years her senior. William, whom had initially encouraged his wife’s artistic studies, expected Edna to conform to a more traditional role and concentrate on a wife’s duties. This led to Edna exhibiting less and mostly sharing her work with close friends, although Henry Tonks persuaded her to hold a solo show at the Chenil Galleries in London in 1914 which was a critical success. After her marriage, Edna’s drawings and paintings became based around her domestic life, she painted the house they lived in called ‘Great Tomkins’, her children and family friends, including the suffragette Katie Gliddon, who was also an artist. It is believed Edna was involved in the suffragette movement. The family home reminded Edna of ‘Wuthering Heights’ depicted by Emily Bronte and she returned to this theme many times throughout her life, often when she was in emotional crisis. The conflict between her desire to paint and her husband’s wishes are believed to have been a cause for her nervous breakdown in 1919. Tonks and Edna’s psychologist helped her work through some of the issues in her marriage so that she could re-establish her identity as an artist. Her husband helped her to set up a new studio in 1922 and she began exhibiting regularly again to great acclaim. Edna also wrote poetry, publishing in 1926 and 1930. 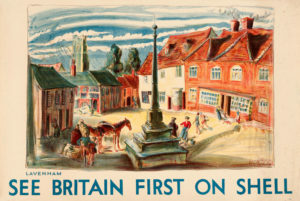 In 1931 Edna’s Shell poster was used in their lorry bill campaign. Through her husband being knighted in 1932 Edna became ‘Lady Clarke Hall’, unfortunately though, William died later that year. Edna was able to keep her painting studio thanks to mutual friends forming a Trust for her and she continued to work. In 1941 Edna’s studio, along with much of her artwork, was destroyed during the Blitz of the Second World War. This was devastating for her and she gradually ceased painting by the early 1950s. Edna died aged 100 on 16th November 1979.